Creation a new version of the schedule based on the current version. The 'As-scheduled' version becomes the 'As-worked' version that everyone has access to within the 'Master' tab. Any changes made to this page will be reflected in the 'As-worked' version of the 'Scheduler' portal. 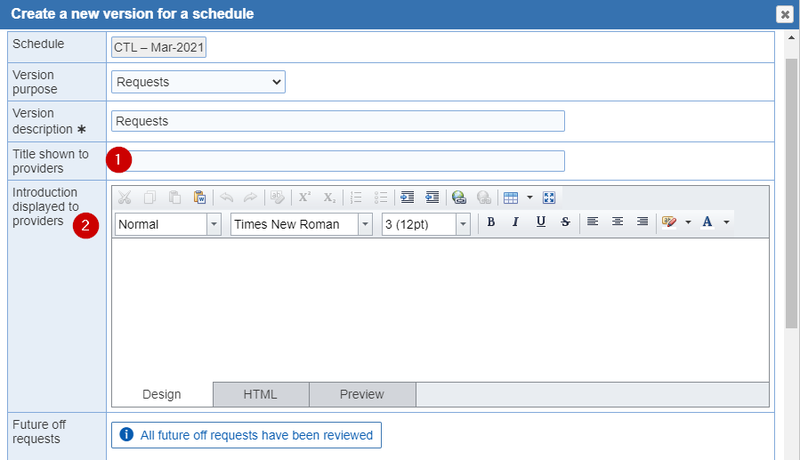 When changing the purpose of a schedule version, schedulers are warned when the change would result in pending emails to not be sent. Working revision: This version allows you to continue working on the schedule without the providers having access. Requests: Publish the schedule for providers to enter in their time off due to vacation and other obligations. Draft: Post the schedule to review a proposed 'Draft' schedule before the schedule is finalized. As-scheduled: Publish the up to date schedule for providers to view, make schedule changes, and adjust hours. As-worked schedule: Current changes made by providers and administrators. The 'As-worked' schedule is usually the latest version of the schedule. Adjusted As-worked schedule: Changes were made to the 'As-worked' version after the grace period closed. The changes are usually done by an administrator (e.g., for payroll purposes) and the administrator wants to preserve the 'As-worked' schedule without the changes applied. If there is no need to preserve the schedule without the changes, then the changes can be made directly to the 'As-worked' schedule without creating an 'Adjusted As-worked' schedule. 2. Version description: This is a required field. Enter in a title. You can name it whatever you want. 1. Title shown to providers: This is an optional field. You can change the title from the default to anything you want. 2. Publication: Enter in the 'Opens/Closes' dates and time. This is based on your preference. You can set it to a week or more. 12:00 AM is the beginning of the day. To set the date to the end of the day, choose 11:59 PM. 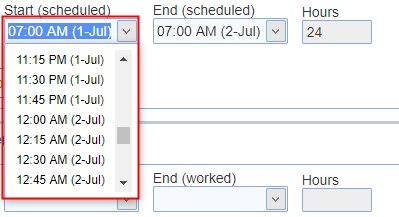 The day of the month is listed within the time picker when the range of time shown spans more than one day. When publishing schedules, specific provider groups can be excluded from receiving a publication notification by selecting the 'Do not publish' check box next to provider group. 3. Publication subject: This is an optional field. A custom subject can be specified for email messages informing providers of the publication of a schedule. If no publication subject is defined, the standard 'publication subject' will be used in the publication notification emails. 4. Publication note: You have an option to add a note to the 'Draft', Requests', and 'As-scheduled' publication emails. An unlimited amount of text can be entered for the publication note included in publication email notifications.